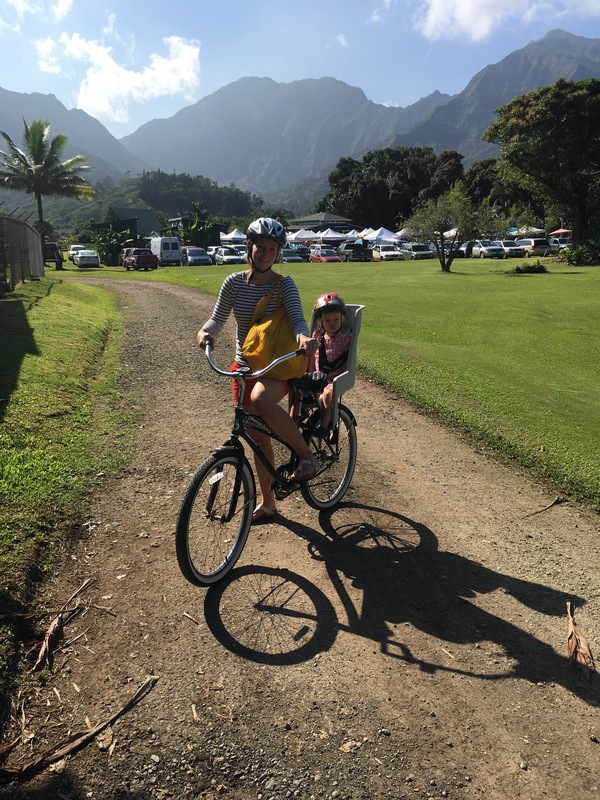 We hear varied responses when we tell people that we are spending 2017 traveling with our toddler. For Rob and me, the decision was a no-brainer. We had the opportunity, in terms of our careers, and we both wanted to spend more time with Blythe. 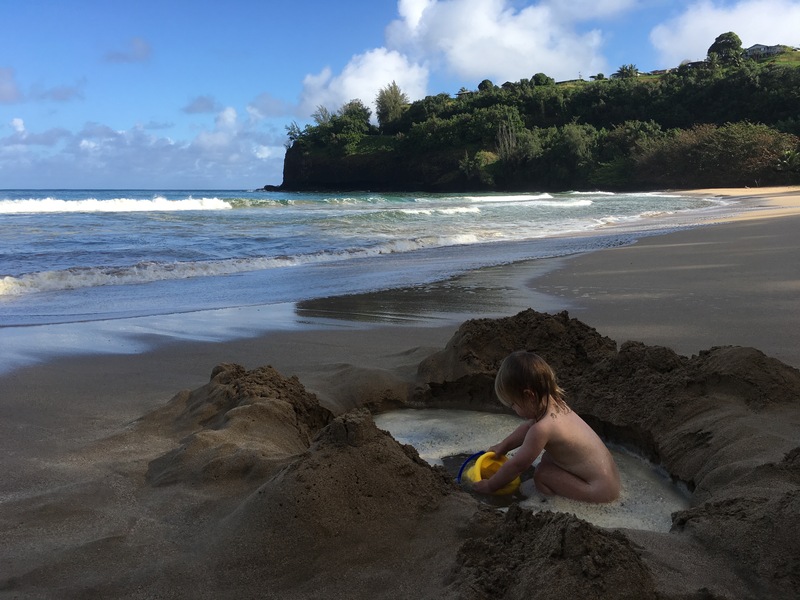 She isn't enrolled in school or activities, so there wasn't much unraveling of her life to do – we just packed up our house and headed to Hawaii! 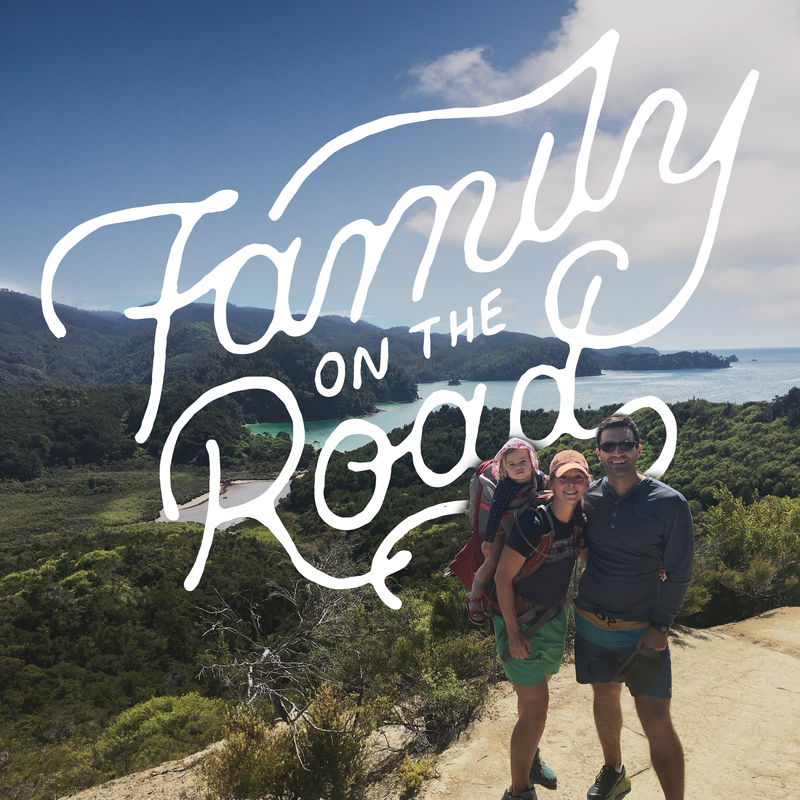 Three months into our travels, we have learned a great deal about ourselves, each other, traveling, living as nomads, and how we function best as a family on the road. I can unequivocally say that our best days have been those when we've explored a new area on foot, by kayak, boat, or bike. 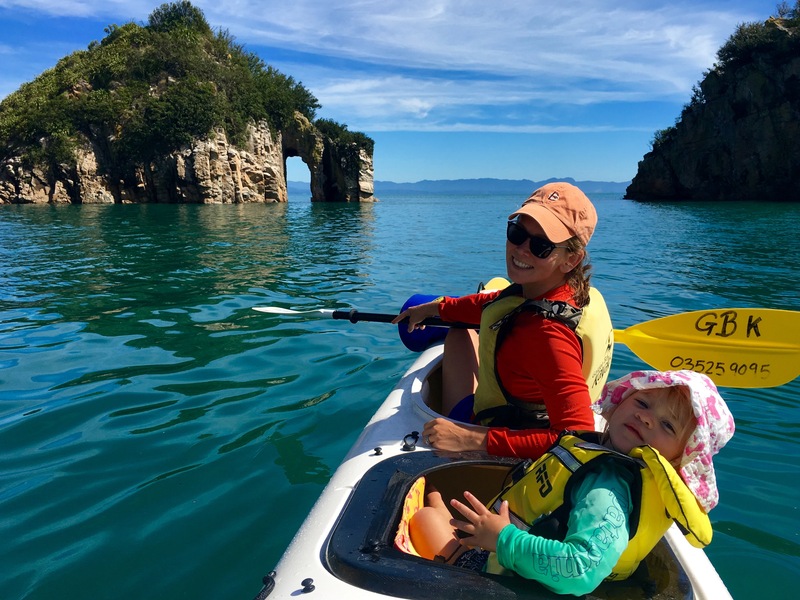 Blythe's first time on a kayak was in the Golden Bay of New Zealand's south island. I was skeptical, but she sat in the middle of the kayak (in her own seat) for the entire time we were on the water. She marveled at the rocky outcrops, pointed at birds, dangled her hand in the water, and peered down to see fish swimming below. When we turned a corner at the end of the day and saw two fur seals playing, she was astonished. When a blue penguin appeared, it was the happiest I've seen her. "Oh, there's a PENGUIN," she squealed. I'll never forget her expression. 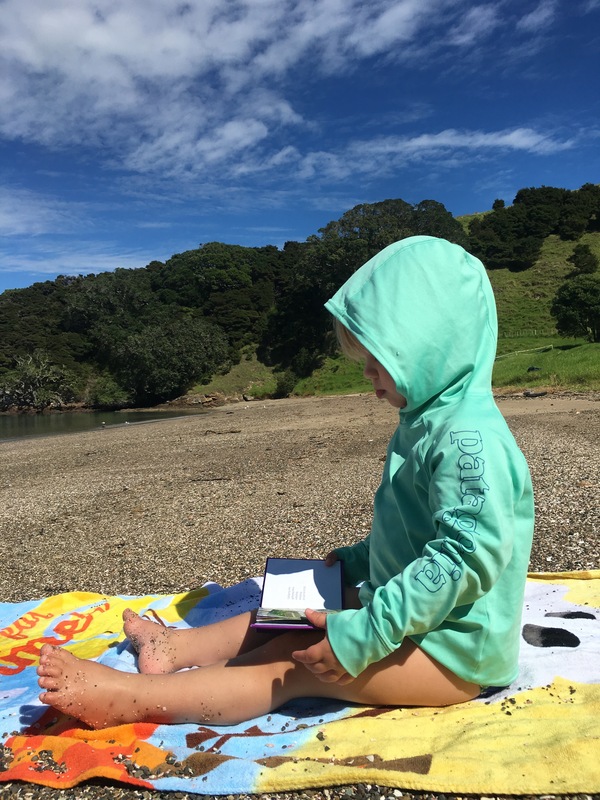 We recently explored Urupukapuka Island in the Bay of Islands off the north island of New Zealand. 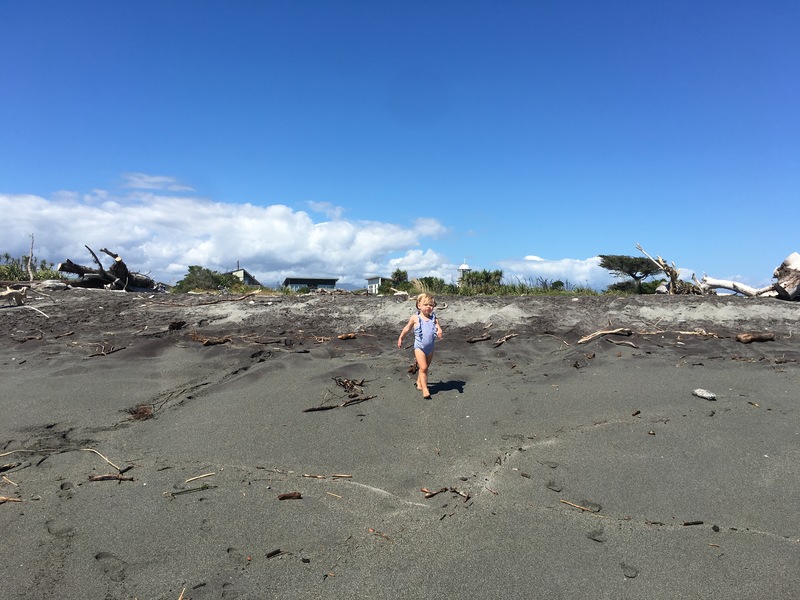 We traveled by boat to the island and hiked to various beaches where we spent the day collecting shells, swimming, and exploring tide pools. Blythe learned that hermit crabs and snails are not to be feared and we talked about how the tiny mussel shells covering the rocks will someday grow into large shells, so we must treat them with care. We inspected a starfish and talked about how it was alive and waiting for the tide to come back in. We read books on the beach and listened to the waves crashing on the shore. I realized that we were attending our own story hour and music class, just a different version than what we partake in at home. I worried that a trip like this could be to her detriment. Would she suffer from not spending time with children her own age every day? Would she miss having the same home to return to every night? Would she fail to adjust to moving to new places on a regular basis (which is hard for even adults to handle)? Instead, she has proved that children are resilient and adaptable. We talk about our new "home" each time we arrive at one. 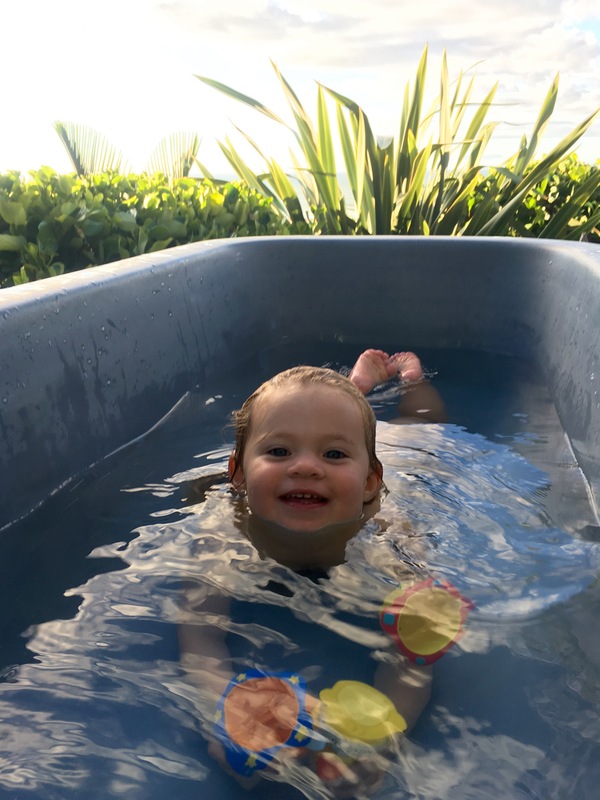 Each has had a feature that she loved; a huge deck with buckets that we filled with water, an outdoor shower, an outdoor bath tub (the winner by far), a bucket of toys. It's the small things that make her so very happy. Frankly, as long as we have a bath, dinner, and read books each evening, Blythe seems to be content wherever we presently call home. This is not to say there haven't been challenges. We are trying to potty train and the upheaval of moving around is not helping the situation. She has stopped taking naps, which means she is exhausted by 7 p.m., as are we. Travel days can be difficult, although you'd be surprised by the amount of joy a ride on a bus brings to a toddler. She has recently learned how to climb in and out of her travel crib. We are trying to take this all in stride. 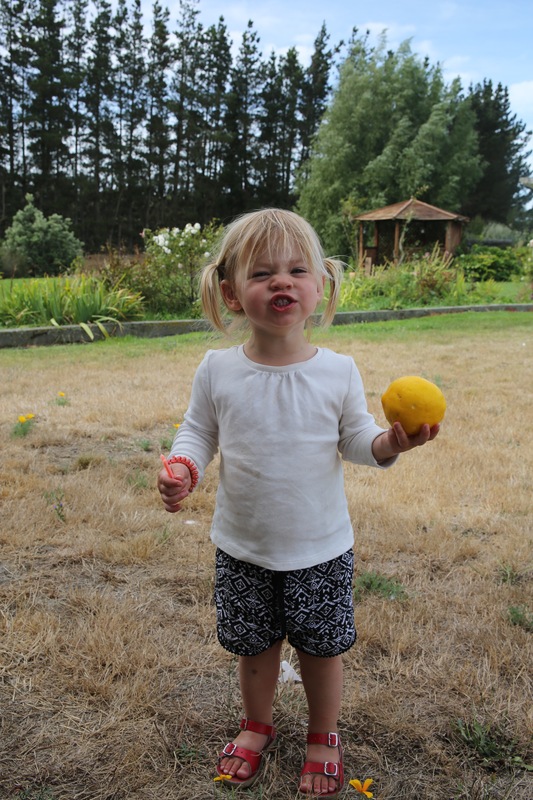 What I'll remember from this trip are the moments that bring us all back to what is important and real: the color of the mussel shells in Ahipara; making ice cream from sand on the beach; selecting Blythe's favorite fruit at the farmer's market and eating it straight away, and living with a family in New Zealand working on their farm with Blythe at our side.